So far Scott has created 8 blog entries. As of December 5, 2018 Bonding Source has shipped 1,773,499 preforms worldwide. The total includes thousands of unique part numbers, and over 60 different types and configurations of film epoxies from various manufacturers. Although the lion's share of the preforms are destined for defense and aerospace programs, other customers include medical, industrial sensors, telecom and various advanced packaging applications. Over the last 12 years our customers have evolved, and realize that the epoxy preform is an integral part of any high precision assembly. Preform drawings are becoming more comprehensive, including details on edge cut quality, shelf life, handling, critical tolerances, shipping, packaging and labeling. Bonding Source continues to invest so that we can meet these requirements and present our customers with preforms ready for the assembly floor. Bonding Source received an order for over 15,000 large area conductive epoxy film pre-forms to support Lockheed's LRDR program. LRDR is a long range radar that will provide precision metric data to improve ballistic defense discrimination and replace existing sensors in the Ballistic Missile Defense System (BMDS). With a mission of protecting the homeland, LRDR will keep pace with evolving ballistic missile threats and increase the effectiveness of ground based interceptors. The pre-forms provided by Bonding Source will start shipping immediately to one of Lockheed's module suppliers and will continue through October 2018. Bonding Source successfully completed an order for 17,000 conductive epoxy film preforms for Lockheed's Space Fence program. The preforms were provided to the module supplier of the Line Replaceable Units that contain 36,000 powerful GaN-based High Power Amplifiers (HPAs) for Space Fence, an S-Band ground-based radar system that will provide the Air Force with uncued surveillance, detection, tracking and accurate measurement of space objects, primarily in low-Earth orbit. Now, 115 crates of these LRUs are packed and in storage ready to be shipped more than 7,000 miles from Clearwater to the Kwajalein Atoll in the Marshall Islands. Bonding Source is also the supplier of conductive film preforms used on the production units of the passive beamforming network hardware used on Raytheon Defense System's Air Missile and Defense Radar. Shipments of the preforms will continue into 2017. Bonding Source is pleased to announce that Ian Wilson has joined the company. Ian was a mechanical engineer at Nanocomp for 7 years, worked as a research technician at UNH, and graduated with a degree in Mechanical Science from UNH. Ian has extensive experience with engineering design, laser operation, fixturing, troubleshooting, quality control, and creating operational procedures. He will be focusing on the programming and optimization of the laser systems, and new equipment development projects. The addition of Ian bolsters our engineering efforts to support growth, and provides redundancy in critical programming areas. 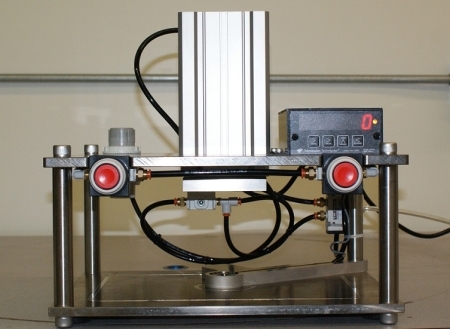 The new EFP 500 offered by Bonding Source is an excellent tool for organizations needing precise control for their epoxy film attachment processes. The press is extremely repeatable and has an integrated load cell to confirm applied pressure. The press puts out over 500 lbs of force to handle large microwave module assemblies and various conductive films that may require more pressure. The press provides a repeatable output to control the process, and is also easily adjustable for various size modules. Please contact us for process details. More adhesive die attach pastes. Coolspan conductive film manufactured by Rogers Corporation. Check out the Product and Services section of our website for details. Please call or email if you'd like more information on these new items or any other products we stock. H9890-6A silver sintered epoxy is the latest from NAMICS and the next generation solution to the Diemat family of pastes. Improvements include longer open and staging time, and great performance on automatic dispensing machines. The thermal performance is excellent and allows for the replacement of inefficient solder attach processes. H9890-6A has been used in production for large volume semiconductor packaging with great results. It is much easier to use than DM6030HK. See the data sheet under Products & Services/Epoxy Paste, Films DataSheets for more info. It’s in stock at Bonding Source with no minimum charge!